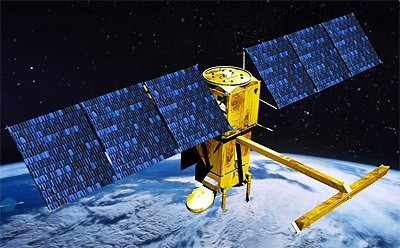 The SWOT (Surface Water and Ocean Topography) satellite, jointly developed and managed by NASA, the French Space Agency (CNES), and the Canadian Space Agency (CSA), will make the first-ever global survey of Earth's surface water and will collect detailed measurements of how water bodies on Earth change over time. The satellite will survey at least 90% of the globe, studying Earth's lakes, rivers, reservoirs and oceans at least twice every 21 days to improve ocean circulation models, and weather and climate predictions, and aid in freshwater management around the world. KaRIn (Ka-band Radar Interferometer): a bistatic SAR system in Ka-band. The interferometric altimeter is a near-nadir viewing, 100 km wide-swath interferometric SAR (consisting of two separated 50 km swaths). The instrument concept uses two SAR antennas at opposite ends of a 10 m boom coupled to a nadir SAR to measure the highly reflective water surface. The satellite is to be built on a new generation bus offering, for the first time, a controlled atmospheric reentry of the satellite at end-of-life. NASA will supply the launch vehicle for a launch in 2020. It is designed to be compatible with the Antares, Falcon-9 and Atlas-5 launch vehicles. A Falcon-9 v1.2 (Block 5) was selected to launch SWOT in 2021 from Vandenberg AFB.